You are here: Home » Spongebob gets a second movie. Spongebob gets a second movie. Good news Spongebob fans. There’s going to be a second movie! It’s only been ten years since his first outing to the Silver Screen. That’s the good news. The bad news is it seems to be in 3D and, if the poster is to be believed, computer generated. Reading more about the film over on the fountain of all knowledge, Wikipedia, then some of my worries are gone. It’s a mix of animation and live action. 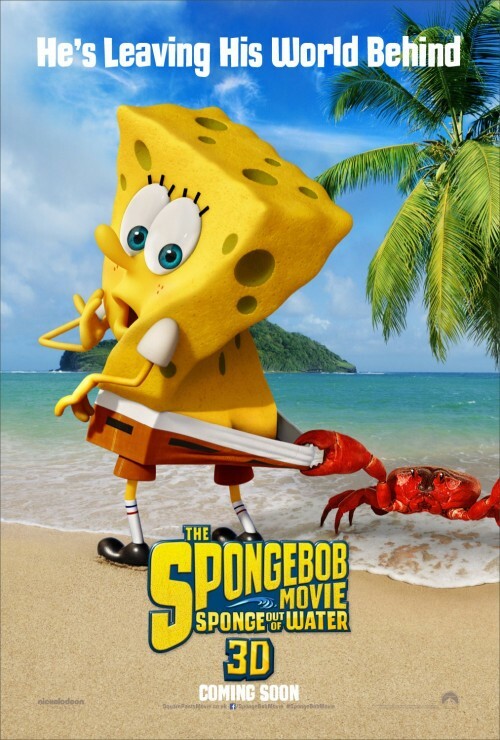 I would expect the live action Spongebob to be like the poster and the animated one like what we have come to love. I’m going to wait until the first, teaser, triler to hit in the next couple of months. I have become a fan of our little yellow sponge from Bikini Bottom. The whole charm of the series is it’s animated and not changed that much in the decades that it’s been running for. It still hasn’t lost it’s 90s charm. Silly and irrelevant. It has everything that children of all ages enjoy. From the student coming back from the pub to the 7 year old who just loves it for its silliness. If the film’s title has anything to go on, it seems that Spongebob is away from his natural habitat. On land but not suffocating as we have seen from the cartoon he can’t live in air without a “water helmet“. Sandy’s biodome is the prime example. No synopsis exists for the film at this time. I even grovelled to the PR company who are working on the film without luck! I did say that I would make one up but I can’t think of one.